Now that Christmas is fast approaching, I have been reading my children Christmas books about the TRUE meaning of Christmas on a daily basis. And I have found it is really hard these days to find books about what Christmas is really about and about Jesus and his birth! So when I saw The First Christmas Night (IDEALS Children's Books), in which Nashville composer Keith Christopher recounts the birth of Jesus to the rhythm of 'Twas the Night Before Christmas, I instantly fell in love with the vivid cover and the lyrical words! 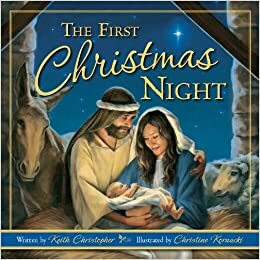 The First Christmas Night (Ideals Children’s Books, October 15) rhythmically recounts the celebrated biblical story, beginning with the arrival of Mary and Joseph in Bethlehem and moving through Christ’s birth, the angels’ appearance to the shepherds and the visit by the Wise Men. The First Christmas Night tells the story of Christmas to kids ages 4 to 8—to the rhythm of another classic Christmas story. In addition to simply being fun, reading books that rhyme can help develop phonological awareness in children at this age, a necessary part of developing verbal language skills and learning to read. The book contains a back page with scripture taken from the chapters of Luke and Matthew, meant for family reading at Christmastime. · Christmas carolers could set it to a tune! If you are looking for a book to read to your children this Christmas that teaches about Jesus and his birth in a fun and rhythmic way, I highly recommend this book! It is beautifully illustrated and written!